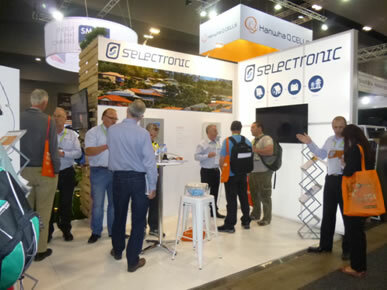 Thank you to everyone who dropped by the Selectronic stand at All Energy 2015 last week. Every year we talk about how busy the show was but this year we were truly blown away by the number of people who came by for a chat and to see what we have been up to over the past twelve months. It was wonderful to see all the familiar faces and also very heartening to see the interest that our inverters are generating in people who were not so familiar with Selectronic before visiting All Energy. Interest in Selectronic was so high that it was lucky we had arranged for our distributors to help man our stand. It was a great opportunity for the guys from Krannich, MPower and Solar Charge to interact with customers, both old and new. And thank you to Si Clean Energy for promoting Selectronic on their stand. to address the myriad of questions and suggestions that were put to us over the two days. A special mention to all those Accredited Integrators who wore their official Selectronic shirts to the show. It was great to see Con Whale, Newman Mundy, Peter Varney, Phil Hapgood , Trevor Robotham and Geoff Boadle - just to name a few - in their Selectronic shirts. It’s a shame you all couldn’t have won our competition. It was great to see a few people entering into the spirit of things and using our prop to tag themselves on Facebook to gain an extra entry – good on you Geoff and Peter! Congratulations to the actual winners –Mark Lewis from Cola Solar on Wednesday and Jade Fennell from 5B Australia on Thursday. They were both thrilled with their hi-vis rain jackets, cordless drill kit and tool bag; according to Mark it was the first thing he’s won other than a chook raffle! There was great interest in the new myGrid Lithium kit which is due for release in February 2016. The Sonnenschein high current lithium batteries are perfectly matched to the high output SP PRO range, allowing very high peak outputs for both off and on grid applications. We were also pleased to promote the close integration between our SP PROs and the Ecoult Ultra battery. Selectronic have assisted Ecoult in testing this new technology; around 10 sets have been in field trials over the past 2-3 years. Rod Scott, our Sales and Marketing Manager, spoke to a full house at the Install Issues session in the Professional Development Theatre on Wednesday afternoon. There was a surge of interest to our stand after Rod’s talk, with people interested in a road test of Selectronic’s new solar calculator named Stella. We will be releasing a beta version of Stella on our website soon. The ATRAA dinner on Thursday night, which incorporated the CEC Solar Design and Installation Awards, capped off an extremely successful All Energy exhibition for Selectronic. Congratulations to Brian England from Self Sufficiency Supplies for winning the Stand-alone Solar PV Power System Design and Installation. Brian used three SP PROs to manage this off-grid installation. 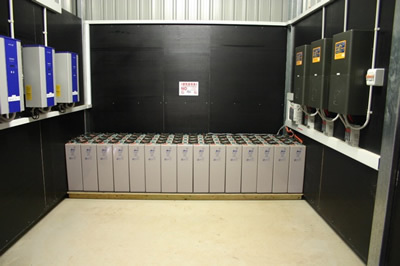 The EnvrioGroup was a finalist in the Grid-Connect Battery Back-up category and they also used SP PROs as the centrepiece of their installation. We hope that all those who visited our stand at All Energy 2015 are using their Selectronic sunscreen and wearing their Selectronic caps. Remember, Selectronic has you covered! Congratulations to Brian England from Self Sufficiency Supplies for winning the Stand-alone Solar PV Power System Design and Installation category at the 2015 Clean Energy Council Solar Design and Installation Awards. Brian used three SP PROs to manage this off-grid installation. And in a happy instance of synchronicity, there is a detailed article in this week’s One Step Off the Grid showcasing the installation. Selectronic Australia is pleased to announce that they have provided a Factory Acceptance test for their highly acclaimed, Australian-made, SP PRO GO series of grid-connected inverters in relation to connection to the AusNet Services electricity distribution network. The SP PRO GO series has been specifically designed to allow consumers to self-consume their solar energy whilst complying with any grid export limits imposed by the utility company. The SP PRO GO series have export limits hard-wired into the inverter. With the correct SP PRO GO, you will only export exactly what the utility has allowed – even if this is zero. While AusNet Services does not endorse or approve specific products, Selectronic has provided AusNet Services with a Factory Acceptance test for each of the SP PRO GO models. This means that if the system is installed according to Selectronic recommendations, AusNet Services does not currently require an export proof commissioning test by the installer. Selectronic believes this will streamline both the installation and approvals process. Many customers are choosing the Selectronic SP PRO GO to give them more choice over how they use grid power. Our world-renowned bi-directional inverter chargers will be on display at All Energy in Melbourne, 7 & 8 October. Come visit us at stand 2323 to see how Selectronic can help you manage every aspect of your energy needs. 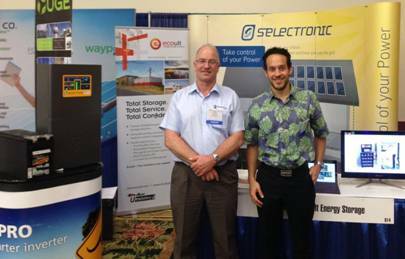 Selectronic was one of only three Australian companies to exhibit at the Asia Pacific Resilience Innovation Summit and Expo (APRISE2015) held in Honolulu, Hawaii from August 24-26, 2015. 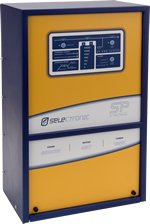 Selectronic were displaying their SP PRO, the Australian made bi-directional inverter charger. with Sean Jobe, Business Development Manager at Ecoult. Rod spoke to delegates from Hawaii, Guam, Jamaica and others operating throughout the Caribbean. He was struck that their requirements were similar to customers in Australia – they wanted a reliable and flexible inverter-charger that worked in both off-grid and solar hybrid situations. Fortunately Selectronic has been manufacturing battery-based inverters since 1981! The highly acclaimed Selectronic Managed AC Coupling for Battery Systems has added selected single phase ABB inverters to the list of compatible Grid Tie inverters. Compatible models will now be marketed using the “Selectronic Certified” branding and are only available from Selectronic and our distribution network. Selectronic Certified ABB inverters will only be available through the normal Selectronic supply channels with very good lead times. Each ABB inverter is supplied with an interface adaptor which is installed inside the SP PRO and then connects to the ABB inverter via a standard supplied network cable. Up to 5 ABB inverters can be handled by a single SP PRO. Any SP PRO with Rev 21 hardware revision (Feb 1st 2015 manufactured onward) is compatible with ABB Selectronic Certified inverters. 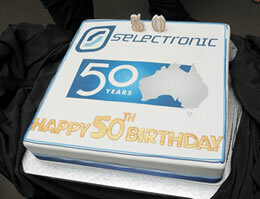 It’s not every day that an Australian Electronics Manufacturer turns 50, but that’s what Selectronic Australia did just last month. Since 1964, Selectronic Australia has manufactured electronics from various facilities in Melbourne. So what better way to celebrate than with a party!!! Pre-Dinner drinks were accompanied by some great Aussie music by local singer Angela Robinson, while the room was littered with memorabilia from the past and a few photos that raised a laugh or two. Once inside the dining room, MC and comedian Ben Price got things off to a great start with impersonations of a couple of characters from the 60’s, while MD Ken Scott explained the company through the sixties, honouring his late parents Brian & Lois Scott who founded the business in humble beginnings in Boronia in 1964, and Angela rounded out that decade with a couple of Aussie songs from that era. As the night unfolded, each decade of Selectronic’s rich history was presented by Lindsay Hart and then Rod Scott with characters, stories and finishing with more Aussie classic songs from Angela. For dessert, Ben Price presented his favourite “Tim Tam” character, while Selectronic showed its character by acknowledging long term staff members of the company for many years of service and presented awards to high achieving customers. Nick Chapman from Solar Works in Cairns was awarded the inaugural “Selectronic Hall of Fame” award for loyalty, skill and, of course, consistent sales over the years. A huge Anniversary cake was wheeled out to mark the special occasion with photographs with the staff. A further award saw Nate Shaw from Eco Coast Solar win the 50 year anniversary Gold SP PRO for his efforts at the All Energy Exhibition competition. As the night drew to a close, stories from days gone by were still being swapped and the problems of the Renewable Energy Industry were being solved, if only they could remember the solutions the next morning at breakfast! This unique night will certainly go down as one of laughs, memories and recognition of this very special Australian Company. Setting up the SP PRO AU or GO series inverter is now quick and easy with the new Site Configuration Wizard contained in the latest SP LINK software. Simply enter the SP PRO model number, either the installed myGrid kit or custom battery bank parameters, the Application and the PV Solar configuration. The new Site Configuration Wizard will do the rest. All the necessary configuration parameters will be set by the Site Configuration Wizard, ready for any additional customising before being sent to the SP PRO. You may download the latest SP LINK from here. Simpler to install with greater functionality, lower cost and superior performance, the new SPLC1200 15kW inverter makes a lot more sense than the alternative option of inverters in a cumbersome parallel configuration. As with all inverters in the Selectronic SP PRO family the SPLC1200 is suitable for Solar Hybrid (grid connected) and off grid power systems in either a single phase, three phase or split phase (SWER line) configuration. Compatible with virtually all battery technologies and renewable energy sources the SPLC1200 provides the solution for the simplest and for the most complex power system. The SPLC1200 also works with any grid connected inverter in a Generic AC coupled configuration or a KACO Powador inverter in a Managed AC Coupled solar powered system. Detailed specifications and performance information can be found here. The TL60 was recently tested by highly respected European Photon magazine and found to be a top performer. With the Powador 60.0 TL3 INT you have taken the right decision. This inverter was tested twice with best marks in the PHOTON magazine. The simple addition of an external three phase contactor circuit into any three phase SP PRO power system will allow the AC source power limit to be increased whilst ensuring a simultaneous connection or disconnect of all three phases. All the controls and settings to operate the external contactor are incorporated into the SP PRO inverter. Features of External Three phase contactor. Extend the AC source power up to 180kW. Great when using high capacity Grid supply or large generator. Dry contact relay provides external contactor control. External Current transformers interface directly to the SP PRO inverters. External Contactor circuit may be wired remotely from the SP PRO inverters to avoid long runs of high current load and AC source circuits. Ensures simultaneous disconnect of all three phases of Grid power or generator power sources. Helps to ensure load balance or export balance is maintained. Features of Solar Hybrid Control. Eight easy to use priority schedules giving full control of your energy use. When you take power from the grid. How much Export power if any to push into the grid. Stay below your allowed limit. When you want to disconnect from the grid. Turning off the SP PRO inverter when not needed. Now available. Remember to upgrade your SP LINK software before upgrading your inverter firmware. Selectronic have re released the KACO 02 series of Grid Tie inverters which can now be upgraded to include a backup power supply in case of grid failure. Clients can now install a high voltage Grid Tie system using the KACO Grid Inverter with the option of adding a Selectronic SP PLUS Energy Centre now or at any time in the future. This will require no modification to the existing KACO solar system and will allow the solar system to continue operating even when the grid has failed. The new features have been developed as a joint research and development project between KACO Germany and Selectronic Australia and are claimed to be the most advanced method of integrating a Grid Tie Solar System with battery Backup system anywhere in the world. The KACO 02 series is available in single phase with power levels up to 6kW. The premium quality KACO inverters have been manufactured in Germany since 1998 using an advanced Carbon Neutral manufacturing plant and feature a standard 7 year warranty. The devasting tsunami in Japan earlier this year has caused many widespread issues. Of course how to rebuild the region's power system is a high priority. Japan is looking to Australian technology to assist the rebuilding. In late July 2011, senior members of Selectronic visited the region along with Austrade Japan to discuss how electricity supply can be improved in the earthquake prone areas. The earthquake has reduced Japan's power generation capability, which could be eased by the use of load levelling technology presently available from Selectronic. Other options for consideration are solar/wind energy fed to the grid at each home with battery backup. These would improve power security as well as ease the burden on the power grid. Lovers of LD, WM and SA series Off Grid inverters will be excited to learn that Si Clean Energy Pty Ltd in Coffs Harbor NSW will be continuing the manufacture, distribution, service and support of these much loved products. As of July 1st, Si Clean Energy will handle all enquiries including the support and service of all units already in the field. Component temperature is a major contributing factor in the failure of any piece of electronics equipment. Performance ratings are usually based on the maximum safe operating temperature of the internal components. Thanks to some very clever improvements to the thermal path inside our SPMC inverters, we have been able to improve the airflow over some internal components by up to a massive 47%, the result is we now offer you even more power and charge amps in the same size package. Even better, the dollars per watt will actually reduce. But even better again, until July 1st you can get the new model at the old price. We are pleased to announce our SP PRO 3 phase PROject is now well advanced. Three phase OFF Grid systems can now easily be achieved by using three of any model SP PRO’s (they must be the same model) and a small interface box called SP SYNC. Simply use a communication cable from each inverter to the SP SYNC and you’re ready to go. The setup with three phases will be the same as single phase by connecting to each inverter using our SP LINK software. 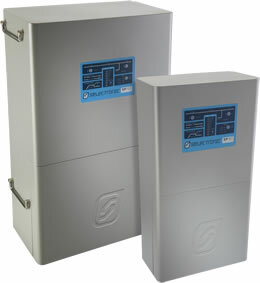 SP PRO three phase compatible models are scheduled to roll off the production line in the second week of May 2011. Order now, available for delivery mid May 2011, delivery thereafter ex stock. Note: Due to end of life component supply, our 3 phase PSA inverters will no longer be manufactured. This is effective immediately. The line between grid-connect inverters, stand-alone inverters and uninterrupted power supply systems has blurred in recent years, bringing a new generation of inverters. Selectronic’s Elena Babitcheva looks at the potential this development offers not only to improve renewable energy generation, but also to save lives. 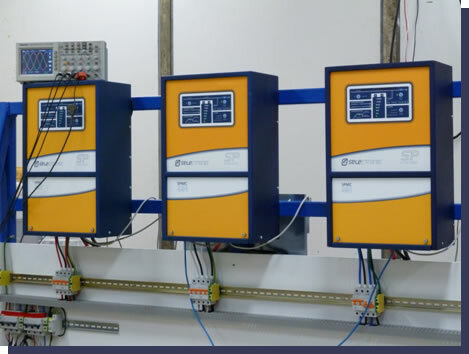 Alternative power system designers are now able to upgrade grid-connect clients to a grid back-up inverter system. An inverter system that has the ability to export excess generated renewable energy to the grid allows system owners to take advantage of the renewable energy certificate (REC) and local feed-in tariff schemes, as well as provide the added security of battery back-up power. Grid back-up inverter systems enable grid and battery bank power-use management. For example, an appropriately configured grid back-up inverter can protect owners from the unnecessary costs of exceeding grid power use (tariff) thresholds. This is important when national grid network changes are considered, with a growing demand on infrastructure, electricity price increases and a wider enforcement of punitive tariffs by energy retailers. During a power outage, or when a configured grid input limit is reached, a grid back-up inverter automatically provides battery-sourced power to the loads, offering the user peace of mind. Applications for grid back-up inverters are infinite, from power-dependent commercial and rural applications to residential fringe-of-grid situations. One Victorian couple saw significant benefits of a grid back-up system: providing power security when it is most needed during the bushfire season. 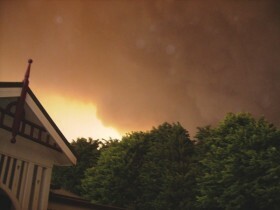 Kinglake residents, John and Mary Broda were caught unaware by the 2009 Black Saturday fires. They had approximately 15 minutes between noticing the smoke over the hill and fighting a blaze on their property. A major problem faced by the Broda family was having no electricity as power lines were destroyed by the fires. Like many others, relying on the mains to power emergency equipment such as communications, water pumps and lighting, the Brodas were left with no means to ascertain fire direction and location and no means to defend their property once it arrived. “We had no warning when fire hit, we just wanted to grab hoses and fight but [we] don’t have mains water so needed electricity to power water pumps to fight the fire. Instead, [we] had to run to the old generator and manually start it, then go to the meter box and switch it over, by then…the front of our place was already burning,” says Mr Broda. Miraculously, the Broda family and their property have survived with little damage. As part of their emergency preparation plan following Black Saturday, Mr and Mrs Broda have now installed an SP PRO Grid Back-Up inverter system (SP Plus Energy Kit) with the expectation that when they experience a power cut, this system will automatically power their house, emergency lighting and fire-fighting equipment, by using electricity stored in pre-charged batteries and an auto-start, back-up generator. “We like the inverter system because it takes care of itself and does the switching over [from the grid to battery back-up] automatically. You don’t have to worry about it, you just have to grab your hose and off you go,” explains Mrs Broda. The Broda family had no electricity for a week after Black Saturday. Their new SP PRO inverter back-up system can be expanded to include renewable power sources such as solar, which would allow them back-up power during prolonged grid outages and would reduce their reliance on a diesel generator. This article first appeared in EcoGeneration: Capital Fanfare (Issue 56 January/February10), p60-61. Selectronic Australia would like to thank John and Mary Broda for kindly sharing their story. Due to high demand, the SP PRO Accredited Installer Training is back! Two training seminars will be conducted in Melbourne in the first week of February 2010. The SP PRO Accredited Installer Training is part of the Selectronic Accredited Installer Program which aims to recognise and reward installers who take initiative to develop their knowledge of the Selectronic products. Selectronic strongly promotes system owners to use a Selectronic Accredited Installer to install their Selectronic Inverter. In 2009, Selectronic conducted twelve SP PRO Accredited Installers Training seminars within the Australian states of Victoria, ACT, New South Wales, Queensland, Western Australia and South Australia and in New Zealand. The training consists of a one day seminar covering product design features, system integration, installation and field servicing of the SP PRO Inverter Series. • 40% longer warranty – 5 year warranty is extended to 7 year warranty. • Warranty maintenance in field. • Installer priority phone support from the Selectronic Technical Team. The 2010 training program will enable those who missed out in 2009 to attend. As with the first round of SP PRO training seminar’s it is expected to book out quickly. To register or to find out more about the commercial benefits of this program please contact the Selectronic Sales team. Are you thinking of installing a Grid Connect system? Upgrade to a Battery Backup with the new 2500W/24V SP PRO inverter (SPMC240-AU). The benefits are worthwhile. Take advantage of the Feed-In-Tariffs in your state. SP PRO has a Grid Feed function that allows you to export any excess generated renewable power to the mains electricity grid. During a power outage, the SP PRO seamlessly switches to backup power sourced from your pre-charged battery, offering you mains quality power and peace of mind. Once the grid electricity is restored, the SP PRO automatically reverts to providing electricity from the grid, simultaneously recharging your battery and maintaining them in optimum condition for the next use. With some electricity retailers now imposing a summer punitive tariff, the dollars on your bill can add up. The SP PRO can protect you from exceeding your punitive tariff threshold by using battery sourced energy to supplement your power needs, thereby saving you money. The new 2500W/24V SP PRO inverter (SPMC240-AU) offers the same 40°C rating, features and reliability as its bigger SP PRO brothers. For full details of the range click here or call 1800 006 474. The number of grid-supply power outages caused by storms and bushfires is on the rise. Can your business, community group, or school afford the effects of another blackout? Say goodbye to the inconvenience and costly effects of power outages on the electricity grid with the new SP PRO series of Interactive Inverter Chargers. SP PRO takes charge of your renewable energy installation, exporting excess energy to the grid while ensuring your battery backup is in optimum condition. When there is a power outage on the electricity grid, SP PRO seamlessly switches to battery backup, allowing you to get on with your business. SP PRO can also be used in Stand Alone Power systems, ideal for energy installations in remote areas of Australia. Because the SP PRO is designed and manufactured in Australia, it’s built for extreme environments. The SP PRO ratings are specified at 40°C ambient temperature and every SP PRO is equipped with superior thermal power management making it the ideal choice for the Australian climate. SP PRO even comes with up to 7 years warranty when installed by and an SP PRO Accredited Installer, so you won’t be left in the dark. Brains or brawn? Don’t compromise! The SP PRO has high speed digital processing and has set new standards for reliability, surge capability and power density. The SP PRO is available in three sizes; 3500W/24V, 4000W/48V and 6000W/48V, with a new 2500W/24V model now also released. For full details of the range and to find out which SP PRO is for you, visit here or call 1800 006 474. 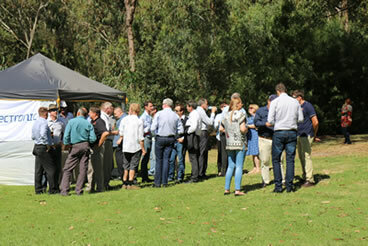 Australia’s premier designers and manufacturers of Solar Controllers and Inverters, Selectronic Australia and Plasmatronics, have joined forces in an Australian Manufacturers Unite Roadshow to promote innovation and leadership from the Australian manufacturers. 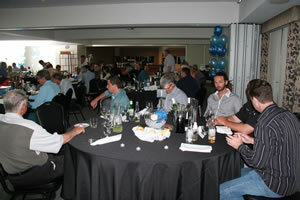 Selectronic initiated the roadshow as part of the Selectronic Accredited Installer Training and dealer support program. Selectronic committed to bringing the training to eleven locations, travelling 18,000km around Australia with 2 tonnes of equipment enabling more dealers and distributors to attend at their convenience. Selectronic sees its customers as its most valuable asset and is therefore focused on empowering its distributors, dealers and sales staff with skills to ensure optimum performance of Selectronic products in the field. A system well installed is more reliable and requires less support time for both installer and suppliers. Ultimately, reliable power makes for happier customers and we all know what that means. Over 150 industry members have attended the Australian Manufacturers Unite Roadshow and SP PRO Accredited Installer Training and there are good reasons for it. The SP PRO Accreditation enables dealers to receive exclusive benefits such as extended product warranty, reduced product prices as well as many other incentives. The accreditation also offers priority phone support and the capability to carry out warranty repairs in field for the SP PRO Interactive Inverter Charger. The concept of banding together was devised through a desire to keep manufacturing in Australia, with the unfortunate loss of BP Solar manufacturing in Australia. “We wanted to do what we could to make industry aware that design and manufacturing is still very much alive and kicking in Australia”, said Lindsay Hart, Selectronic Sales and Marketing manager. The main points of focus of the show were the latest innovative features of the new Selectronic ‘SP PRO Stand Alone and Grid Feed Interactive Inverter Charger’, ‘Kaco Grid Connect Inverter’ as well as the ‘PLH 120 volt’ and ‘Dingo’ controllers from Plasmatronics. 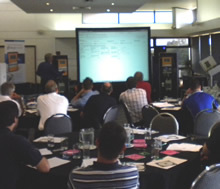 Selectronic have had fantastic feedback regarding the roadshow and the training to date from the attendees across Australia. Selectronic and Plasmatronics would like to thank all of those who have attended. One of the most anticipated products from an Australian manufacturer in a long time. The all new SP PRO series is an intelligent and powerful Interactive Inverter Charger. The expectation of this product is huge, demand has been unprecedented so place your orders now to avoid early disappointment. Refer to the SP PRO site for full details including our great introductory prices.